Here's where you can find me at this year's Dragon*Con before I swing over to Chicago for Worldcon. Artist John Picacio presents a slideshow and Q&A featuring the artworks he created for the best-selling 2012 A SONG OF ICE AND FIRE Calendar. Artists John Picacio, Berni Wrightson, Coop, Dave Cook, Steven Archer and Billy Tackett present and discuss their horror work, as well as works that inspire them. 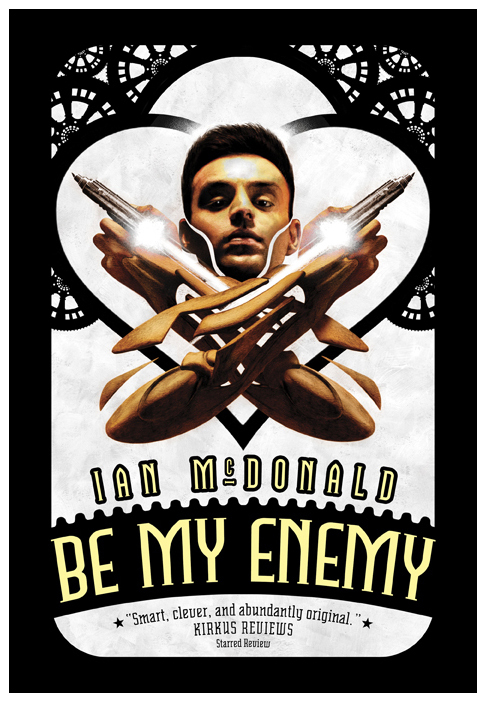 Here's the official cover for Pyr's release of Ian McDonald's forthcoming YA novel -- BE MY ENEMY. This is the followup to his terrific YA debut PLANESRUNNER -- a Sidewise Awards finalist, and runnerup in this year's Locus Awards for Best YA Novel. Here's a little behind-the-scenes that shows why art directors are one of the most valuable links in the publishing chain. I turned in my catalog version of this cover and Lou Anders, Pyr's art director, suggested a couple of tweaks. All and all, he thought we were good to go. Unfortunately, I kept feeling like I had fallen short of the best solution. Way short. Not Lou's fault. My fault. And it nagged me. A lot. For weeks. So it's July 13th and it's almost time to go to press. The smart call would be to keep my mouth shut and let my submitted cover go to press. But I'd been telling Lou that I wasn't sure if I'd gotten it right yet. We're at San Diego Comic-Con and we're about to have lunch, and I say to him again, "I'm still not sure about that cover. You mind if we brainstorm together here?" Bear in mind that this cover is already pretty much turned in. No one in their right minds should be revisiting this cover this close to deadline. We're trading images and phrases back and forth for about a minute and Lou says, "Gimme something to write on -- fast." 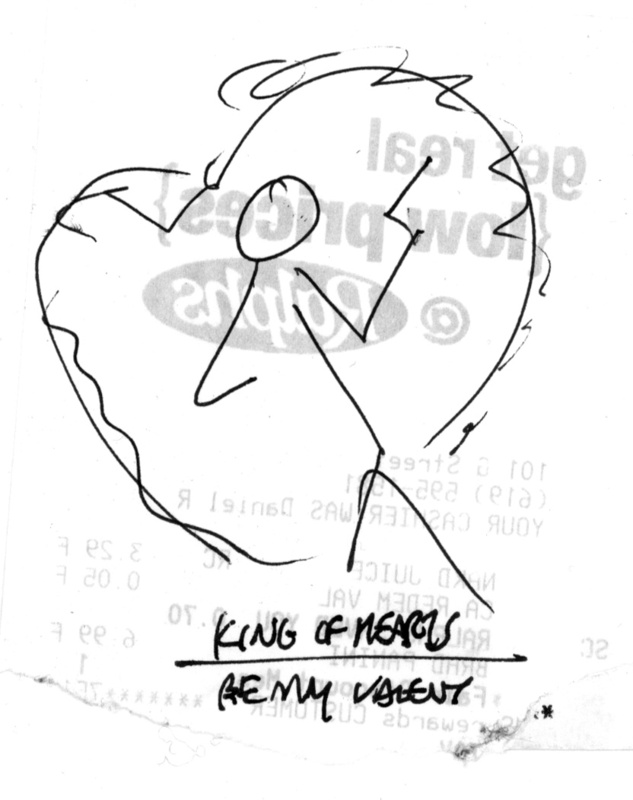 I hand him a grocery receipt, and he scribbles this tiny little scrawl. He says, "Be my enemy.....be my valentine.....you see?" I saw a stick figure holding a gun (maybe running? maybe breakdancing?) 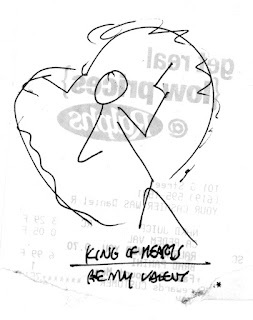 surrounded by a heart -- were we talking about a roadsign of sorts? Lou said, "No, I'm seeing a guy like this (points his index and middle fingers like pistols and crosses his arms across his chest). And then -- that's when I saw something he didn't -- I saw a skull-and-crossbones cross-pollinated with a valentine. Lou said later he wasn't thinking 'skull-and-crossbones', but he just let me run because it made perfect sense. I don't think he saw the abstraction coming either. As is often the case when I work with Lou, my 'A' plus his 'B' often equals a 'C' that's more than the sum, and more than we first imagined. I took that Lou Anders thumbnail home, and started over from scratch. Several days later, I was finished and the new final cover was born. Grace Conti-Zilsberger finished the layout of the rest of the jacket . She did a great job on-the-fly. Ian McDonald is one of the best writers in all of genre fiction. BE MY ENEMY is going to blow readers' minds. Heads up, folks -- if you haven't read PLANESRUNNER, snag it now so you'll be ready when BE MY ENEMY arrives in September. Heads up: NEW Blog Home!